Saudi Arabia, January 16, 2018: HVACR Expo Saudi (14-16 January 2018 at the Jeddah Centre for Forums & Events) has hosted the first ever EU – Saudi Arabia Energy Efficiency Meeting, and seen the successful product launch of Samsung’s 68% energy saving cooling system. The topic of HVACR has been heating up in Saudi Arabia since the outset of 2018 due to a combination of increasing power/fuel tariffs, growing public awareness, and a strengthened sense of responsibility that is sweeping the globe. 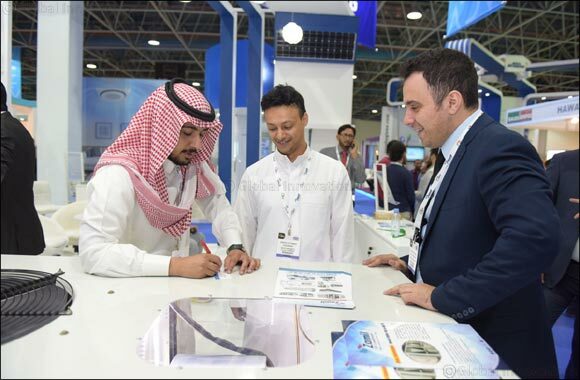 Facing a new paradigm in their industry, thousands of HVACR professionals have already visited the Jeddah Centre for Forums & Events over the first two days of Saudi’s largest dedicated indoor climate and refrigeration event, HVACR Expo Saudi. Having played host to the successful launch of the world’s first Wind-FreeTM air-conditioner by Samsung, HVACR Expo Saudi will continue to bring together the most innovative HVACR solutions and equipment from over 80 local and international manufacturers until 16 January 2018. Samsung’s Wind-FreeTM Cooling technology is spreading the efficiency buzz by saving up to 68% of energy. With the same targets in mind, Carrier in Saudi Arabia offers a wide portfolio of sustainable products and services, thanks to Carrier’s global R&D investments aimed at advancing energy efficiency and sustainability. The reputable brand are presenting the Carrier® AquaForce® 30XV air-cooled variable-speed screw chiller – delivering industry leading efficiency ratings. One of the first air conditioning companies in Saudi Arabia, exhibitor Zamil Air Conditioners will be presenting a handful of products at HVACR Expo Saudi including their TW6 air handling unit and rooftop package unit. The company have a keen focus towards guaranteeing product performance in compliance with local, regional and international specifications and standards for operating performance, cooling capacity, energy efficiency, airflow, noise level and durability. “Energy efficiency and sustainability is a growing concern all over the world for apparent reasons. In a region like the Middle East, with its extreme temperatures and where HVACR is essential, it is even more important to have adequate standards and regulations in place to keep energy consumption at a reasonable level,” says Markus Lattner, Director of Eurovent Middle East and speaker at the first ever EU – Saudi Arabia Energy Efficiency Meeting which opened HVACR Expo Saudi earlier this week. A focus on the standardization of HVACR systems in Saudi Arabia remains on the agenda throughout the exhibition, being a hot topic in the schedule of free-to-attend CPD (continued professional development) certified workshops. The remaining sessions will feature topics from the latest solutions for Smart & Sustainable Buildings, Dedicated outdoor Air Systems, and Green Technology HVAC Systems. Sponsored by Carrier as Platinum Sponsor, Zamil as Gold Sponsor, also supported by Samsung as Product Launch Partner, HH-Shaker and Midea AC as Exclusive Registration Sponsor andAl Salem Johnson Controls – YORK as Workshop Sponsor, the event is organised by dmg events Middle East, Asia & Africa and MICE Arabia, and co-located with FM Expo Saudi and Saudi Clean Expo. Both events run until 16 January at Jeddah Centre for Forums & Events, and open 4pm – 10pm daily. Entry to the events is only for trade professionals and over 18s, and is free of charge to visit.